Hi, Inkwell followers. 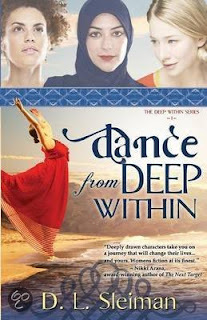 If you dig way back in your memories, you might recall my contemporary novel, Dance from Deep Within. And if you happened to actually read this novel, you might remember that there was a teaser for book 2 in the back. Fast-forward four years, and where is book 2? Well, that's a bit of a saga itself. I actually wrote book 2 shortly after book 1 released in late 2013. I even made a verbal agreement with WhiteFire to publish book 2. But, around that same time, I also had the idea for my YA Valiant Hearts series. And when Bethany House Publishers purchased that series, I had a strict exclusivity clause that didn't allow me to publish Dare from Deep Within during the duration of that contract. These things happen in the publishing world...no hard feelings. Except that a number of my readers were seriously disappointed not to get the next installment of the Deep Within series in a timely manner. So I'm happy to announce that the moment has nearly arrived. 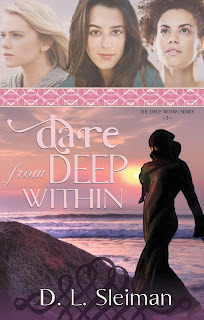 Next week, exactly four years after the release of book 1, Dare from Deep Within will finally release!!! And I have to say, I love this series, probably more than any of my other books. I love the strong sisterhood bond and the theme of intimacy with Christ and searching for truth from deep within found in book 1, along with the romance, humor, and drama that ensues. In book 2, the saga continues as the gang must work together to save an abused friend, with all the humor, romance, and spiritual depth that you might expect from the sequel in this series, plus a greater sense of suspense and urgency as they face the darker, terror-ridden side of Islam. The book examines risks and taking chances for what we truly believe. I hope you didn't give up on me after so many years, and that you're still excited to read the next installment. And if you haven't picked up the Deep Within series yet, I invite you to start with book 1! Three young women from varying backgrounds risk everything to help a friend escape her abusive family. Still at odds with her own Muslim parents, Layla faces unexpected challenges when her childhood companion shows up on her doorstep. As Fatima risks everything for freedom, her desperate circumstances draw a new circle of friends who will be forever changed by her plight. Layla, the Muslim-background believer, turns to a forbidden boyfriend for the guidance both to protect Fatima and to find her identity apart from her parents and her former culture. Rain, the bi-racial hippie chick, secrets Fatima away from her violent family, but as the experience draws her closer to Christ, Rain's own relationship with her significant other, James, will suffer the consequences. Sarah, an ultra-conservative Christian on the surface, is torn between a desire to help Fatima and a need to conceal her shameful double life and dangerous habits from her older sister Allie. As they struggle to safely guide this courageous young woman through a maze of intrigue and terrorism, all will be forced to ask what they are willing to risk for love, for each other, and for God. Pre-order paperback now. Or stop back after November 15th to order the ebook! Congratulations Dina! I'm so pleased that you've continued this story as it's so relative to our current events. Thanks. Yes, I really hope it picks up some momentum. It's so relevant right now! Well, it was mostly written, so it was a joy to finish it up and get it out into the world. And thanks. Congratulations, Dina! So excited for you and to read this book.